The Bissell Symphony Pet All-in-One Vacuum and Steam Mop, 1543A is the upgraded version of the Bissell Symphony 313A. In this review we will take a closer look at the improvements and but will also give you a run down of the features of this machine as well as the positives and negatives about it. 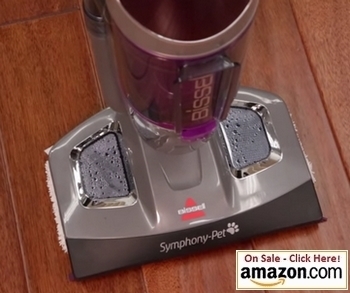 What I like most about the Bissell Symphony Pet is that it is a vacuum cleaner and steam mop rolled into one. It can vacuum and steam at the same time or you can either just vacuum or just steam your floor. This will save you lots of cleaning time, effort and the use of a separate machine. It can be used on ceramic tile, vinyl, marble, stone and sealed hard wood floors. It is not recommended for unsealed wooden floors or carpets. 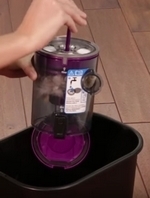 The water tank takes 13 ounces and will give you approximately 15 minutes of steam time. The water will take a very quick 30-90 seconds to heat up. The switch controls on the handle makes it easy for you to choose between hi-steam, low-steam and vacuum modes. Hi steam is ideal for sticky messes and durable floors whereas Low steam works well for every day cleaning and floors you need to be careful with. The indicator light will stop flickering when the water is hot enough to steam. The cyclonic vacuum separates dry dirt and debris from the wet. The unique Drop-IT design of the dirt tank makes it super easy for you to clean without having to touch the dirty icky stuff. The cleaning pads that are ideal for everyday use can be washed but there are also handy swifferbissell steamboost disposable pads that you can throw away when you are dealing with pet messes. The re-usable cleaning pads have small pockets where you can insert fragrance disks into to leave your floors smelling extra fresh. It vacuums and steam mops at the same time. No more sweeping, then vacuuming, then mopping anymore. With the Bissell Symphony Pet you can do all in one easy step. The unique Drop-It tank system, where the vacuumed up dirt is collected, makes cleaning a breeze and is one of my favorite features. You will never have to get your hands dirty again! It is as simple as holding the tank over your trash can, opening the bottom and pressing the push lever at the top and the mess will drop out. You don’t need to use any cleaning solution in this machine. Steam will kill 99.89% of all germs and bacteria. It is recommended that you use distilled water (at room temperature) to extend your machine’s life. The water tank and dirt tank are both see-through enabling you to see at a glance how much more cleaning you can do before topping up with water or emptying the dirt tank. The heavy duty power cord is handy 25ft long making it possible to easily clean a room without having to use extension cords. 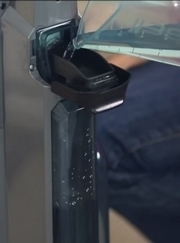 The cup to refill the water container clips onto the handle for easy storage but some customers have complained that it gets in the way and falls off easily. The solution is to not store it on the handle. When using the steam mop you need to continuously press on the build-in switch in the handle which can be an issue if you have arthritis. Take note that it is very easily pressed and held in place and should be fine if you don’t have arthritis related problems. 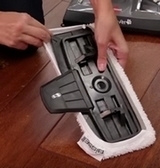 If your machine is not vacuuming well make sure you have the right pad tray in place. The steam mop tray and the one for disposable steam boost pads looks very much alike. The steam boost tray’s lip on the side is just a bit higher and will reduce the suction power when used in conjunction with the regular washable pads dramatically. Make sure you are using the right one. The bristles at the sides will help with collecting pet hair and cleaning base boards. The new dirt tank system is a marvel and you will never have to struggle with emptying it or getting your hands dirty ever again. This is a great machine for everyday cleaning and will save you a lot of time, money and cut out the need to use different machines for different jobs.